Renfrewshire Chamber of Commerce has been chosen as one of 4 Scottish Chamber areas for a new Scottish Government pilot taking place between Sep 2012 & March 2013, aimed at encouraging small, local businesses to employ a graduate. (Other areas include Lanarkshire, Ayrshire and Dumfries & Galloway). 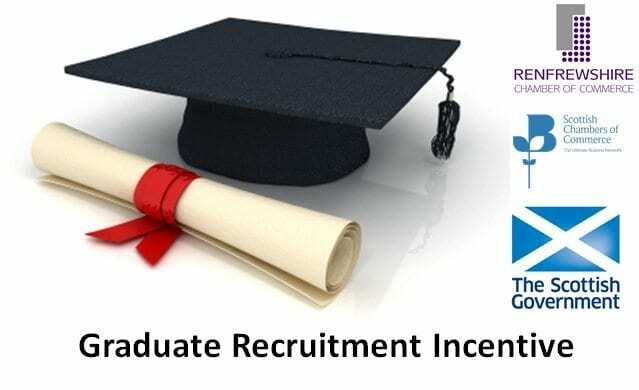 The Graduate Recruitment Incentive (GRI) is a payment of at least £3,000, available for employers that successfully employing a graduate into a new, permanent position. Commenting on the new initiative Chamber Chief Exec’ Bob Davidson said “…. for companies based in Renfrewshire of 50 staff or less, this incentive of at least £3000 allows local businesses to grow by employing a graduate. We hope this incentive will encourage organisations from all sectors to create a new position for a graduate and help move their company forward. Combining this with the new Invest in Renfrewshire programme from Renfrewshire Council – there is great support available to reduce youth unemployment and grow the local economy”.